Sausage with vidalia onions and fire roasted peppers, sauteed in olive oil. This is a simple and really good recipe that doesn't cost much to make. The Vidalia onions and the fire roasted peppers really stand out and compliment the sausage well. This recipe also uses Tassos Florinas Roasted Red and Yellow Peppers, and Coratina Extra Virgin Olive Oil. Slice the sausage into 1/4" thick slices and set aside. Slice 1 or 2 peppers into bite sized pieces and set aside. Chop the onion into bite sized pieces and saute in the olive oil over medium heat until it begins to soften. Add the peppers to the onions and cook until the onion is semi translucent. Add the sausage and continue cooking until the sausage begins to brown or is done to your liking. That's it. 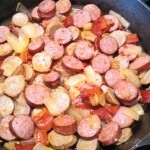 Sausage with vidalia onions and fire roasted peppers is a flavorful main dish that is really easy to make. We went shopping at Costco recently and found a jar of Tassos Florinas Roasted Red and Yellow Peppers on the shelf. We weren’t sure what we were going to use them for but figured how bad can those be? We weren’t disappointed. We had a beef summer sausage and some brats in the freezer and decided to try the peppers with that. 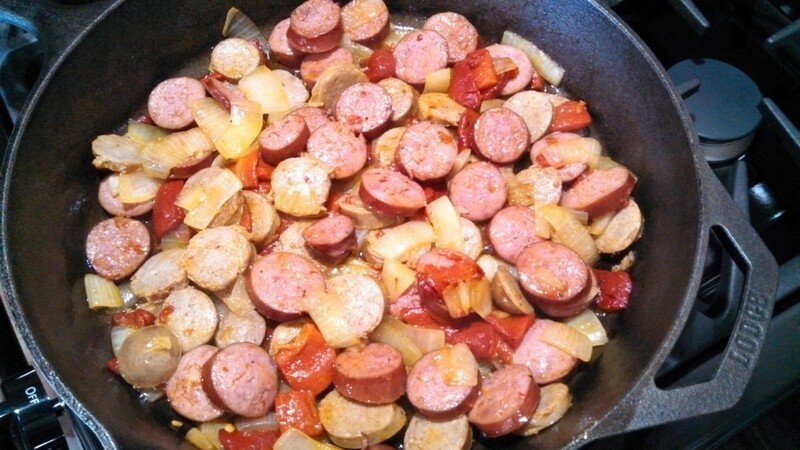 Sausage with vidalia onions and fire roasted peppers, sauteed in olive oil. It was really surprising how these few ingredients worked out so well together. So good and easy to make.